Miass River Sunrise: "In the mist, a calm, mirror-like stretch of the Miass River flows through the foreground along a frosty landscape near Chelyabinsk, Russia. 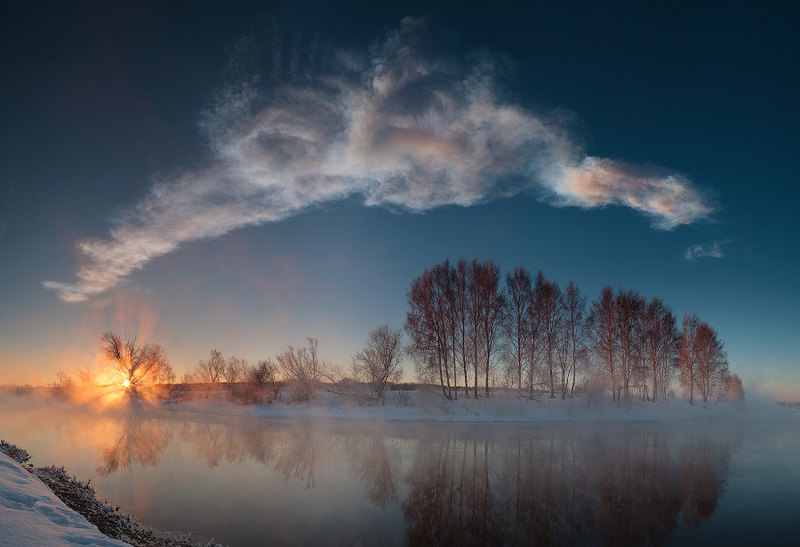 But the long cloud wafting through the blue sky above is the evolving persistent train of the Chelyabinsk Meteor. The vapor trail was left by the space rock that exploded over the city only 18 minutes earlier, causing extensive damage and injuring over 1,000 people." (2 March 2013). Image © Marat Ahmetvaleev via NASA. 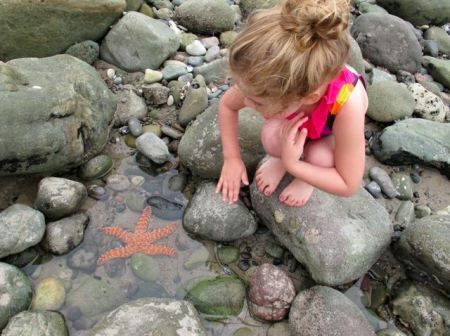 Shells on the Internet's Beach: this page is dedicated to recommended posts, pieces and pages which reflect the themes of this blog. Explore Malibu lagoons. Image Source: Red Triangle. The shifting Millennial present is as much a time of anxiety-ridden change as it is of massive potential. Whether the 21st century turns hellish or hopeful depends partly on the daily choices we make and thoughts we have today. Will Buckingham, Isaac's Gift (8 March 2013) at Aeon Magazine. A piece of creative non-fiction about gift-giving in the Tanimbar Islands of Indonesia and how an outsider unwittingly disrupts traditional gifts' mystical network of ancestral powers. Andrew Evans, My Louisiana Ghost Story (23 October 2011) at National Geographic. Travel writer spends an eerie night in an unsettled Lousiana B&B. Penumbra (2009) © Randall Stolzfus. 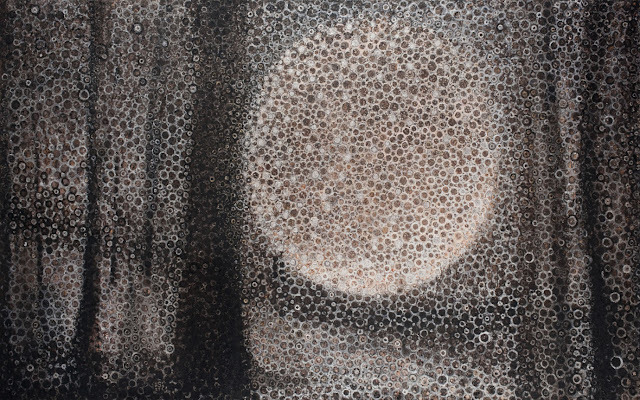 Randall Stoltzfus, Penumbra, Painting: Completed 2009. Oil and palladium leaf on canvas, 60 x 96 inches. An oil painting that changes according to the level of light in the room: "The painting now known as Penumbra was first exhibited in 2004 with the title Will o’ Wisp. It is one of a series of paintings inspired by visual phenomena experienced while walking in the forest at night. The optical range of the painting was extended in 2009 by a reworking that included significant amounts of Palladium leaf and a vibrant iridescent silver oil paint. As with an antique Japanese screen, the resulting surface sings especially at lower lighting levels, where the presence of the leaf becomes prominent." Nadia Sobin, Quantum Esoterica: Metastructures (12 November 2012) and The Doors of Perception (15 December 2012) at Trans-D Digital Art. 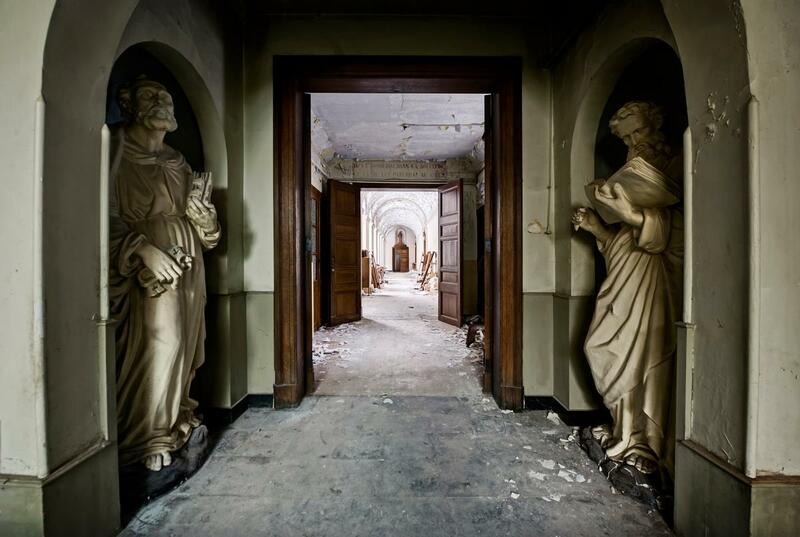 Doorways to nowhere. Doorways to the gods. Artist Dia Sobin's thoughts on trans-dimensional worlds, their organic geometries, and corresponding energies; these thoughts relate to the impact of the Web on our consciousness, and our growing awareness that we only perceive a small part of a much larger reality. See her prescient remark on quantum consciousness: "Organic geometry ... the idea of energy distributing itself... the concept of energy having consciousness, and consciousness being the fabric, the means upon which - and through which - energy distributes itself ... acts ... and, that action - through the event of idea and creative impulse - takes form ... and, within a certain framework, must take form ... and depending upon the conditions of its dimension, is forced to take form in specific ways. In this dimension (sic) ... perhaps in all, to some degree, the determining law of structure might be akin to both music and mathematics ... the idea of rhythm, frequency, wave, fluctuation, sequence. In this way, "reality" - the physical world - cannot be as rigid as we perceive it visually. It is always in a state of flux, vitality, movement. A fluid fabric of color, pattern, sound. The law of this dimension (sic) may be seen (also) as akin to time ... an imaginary structure... a symbolic structure composed of units and cycles ..." (NYC 8/4/1983). Worldline on Values and Societies. Elena Malec, From the Tower of Babel to the Endless Column (5 May 2006) at Values and Societies. 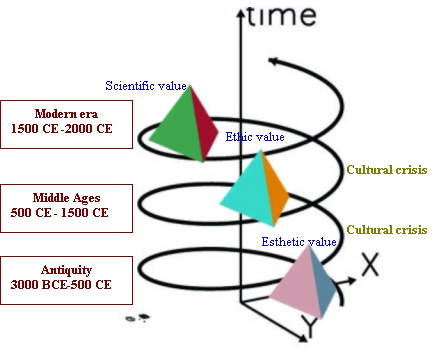 A socio-cultural evolutionary post on the progression from 3000 BCE to 2000 CE of Esthetic, Ethic, and Scientific societies. Over five thousand years of human history, Malec argues that dominant values shifted from beauty, to goodness, to truth. While this comment from Malec is overly deterministic and unreflectively Hegelian, it nonetheless highlights that while the outward form of social values may change, the underlying structure of societies can persist across millennia. Malec closes with an appeal for a grand, infinite synthesis between esthetic, ethical and scientific values. Rather than expecting the more likely plunge into crisis and conflict, which will forge a new order on a persistent underlying social hierarchy, Malec predicts the third millennium will see the rise of a sort of triple helix of ancient, medieval and modern traditions: "For over 5000 years civilizations and cultures evolved according to a similar pattern, namely that of closed systems of values always with a chief value at the top of the pyramid, Beauty (Antiquity), Goodness (Middle Ages), Truth (modern era) with esthetic values as chief values for the ancient world, ethical-religious values as chief values for the medieval world, and scientific values as chief values for the modern world. The third millennium of the common era makes possible a shift from the closed system of values to the open system of values, from the pyramid of values to the infinite column of values. Artistic knowledge, ethical-religious knowledge, scientific knowledge can and must harmoniously be developed by people and for people in an open system, that is with an inexhaustible supply of energy which is nothing else but the human spirit. The humanistic message of our era is that of peaceful coexistence and appreciation of artistic trends, styles, movements, ethical or religious schools of thought or practice, ways and methods of scientific research and study as equally valid forms of knowledge." Given the exceedingly low value currently placed on the arts, culture, beauty, spirituality, consciousness and morality in developed societies, I find this prediction to be less likely than the advent of a hellish bio-technocracy that will be falsely convinced of its own endless virtues. Nevertheless, Malec's piece is thought-provoking because it reveals the hopes awakened by the Information Age and communications boom at the start of the new Millennium. In other words, Malec is more successful at responding to the Millennial Zeitgeist than she is a likely predictor of the future. 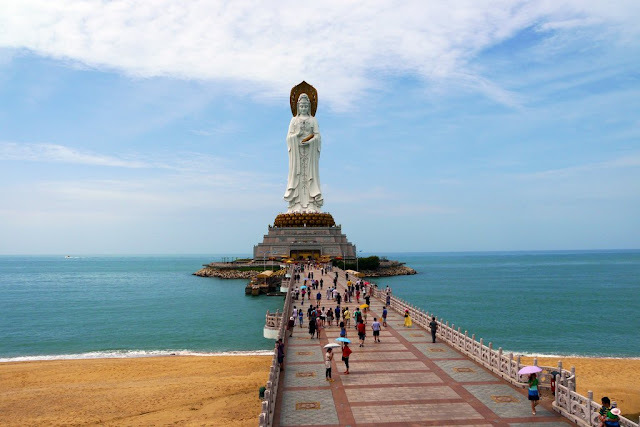 Opinion piece from Order of Truth blog, Humanity needs to devolve in order to release the ego state and move forwards to a new era (3 March 2013). While Order of Truth blog tends to bang on about the 99 per cent and New World Order conspiracies - both signs of a displacement of responsibility complex so popular today - this post hits the nail on the head about rampant egotism creating solipsistic micro-cultures and divisive, destructive Millennial interest groups. This piece casts light on Histories of Things to Come's blog posts about generational perspectives and generation wars: "Even those who purport to want to change the way the world is maintain their protests and concerns within their own bubble, which only serves to self-perpetuate the perception of exclusivity within their group and their perceived exclusion by society as a whole. Very few make the effort or develop their perceptions to encompass every opportunity to connect with those outside of their world. And yet that is the purpose – to connect with as many people as possible so they come together in one strong purpose. The young, old, all races, all members of social structures need to be included, not excluded. So many organisations and people get caught up in the trap of ‘doing their own thing’ within their own peer group, and create the illusion of making vast changes, when in fact, they are only making changes within their own micro-society, or very minor changes to the world as a whole, many of which become diluted in time. Many are still trapped in the ego state – perhaps not realising their entrapment – constantly looking for recognition and praise to fulfil their own cravings and wants. The ego is dismissive and prejudice, contrary to the objective of inclusion and change, however good intentions may be. This is a problem with ‘groups’ – they are exclusive, almost like member’s clubs, where only the select are allowed entry, and where many are still perceived as ‘outsiders’ or as a threat to the objective. In a society where selfish thought and mistrust have been nurtured and promoted, it can be hard for those with good intentions to realise their contribution to the system of control and separation." A commenter on this post remarked at Order of Truth: "Very brave of you – I am trying to get this across without sounding ‘inappropriate’ and non-community oriented – except I have researched hundreds of these organizations. Having encountered some of these groups myself, I wonder why with so many, not more is really being ‘done’. There are hundreds and thousands of ineffective ‘groups’. no idea where the money really goes – but more than anything, poll some of these people and you will find they do not know the company or group they are lobbying for, and some only go to support causes via hearsay. Give them a real life issue to solve in their immediate area, and they will opt out." Cary and Michael Huang, The Scale of the Universe 2 (2012); see also the earlier version, The Scale of the Universe (2010). Painted reality: Woman in 1910. 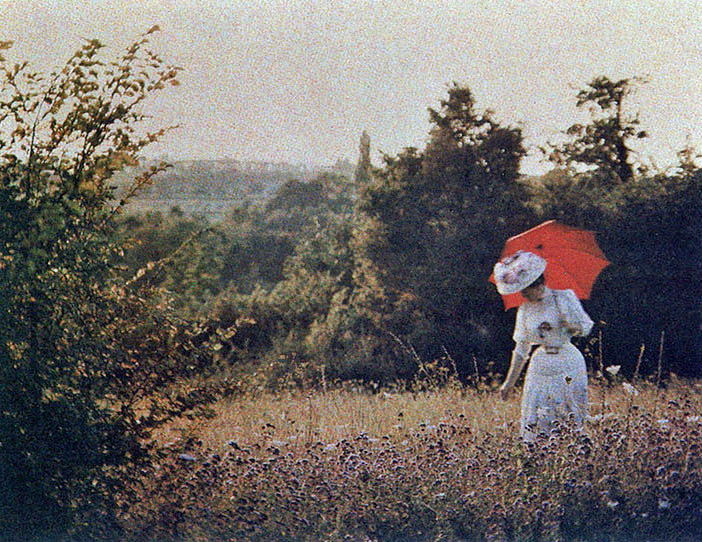 Autochrome by Antonin Personnaz. Image Source: Retronaut. 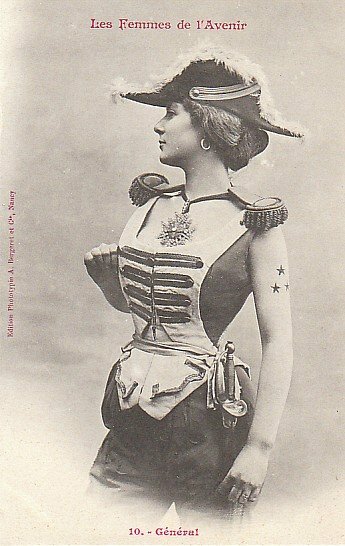 Woman of the Future: General (1902). Image Source: Retronaut. 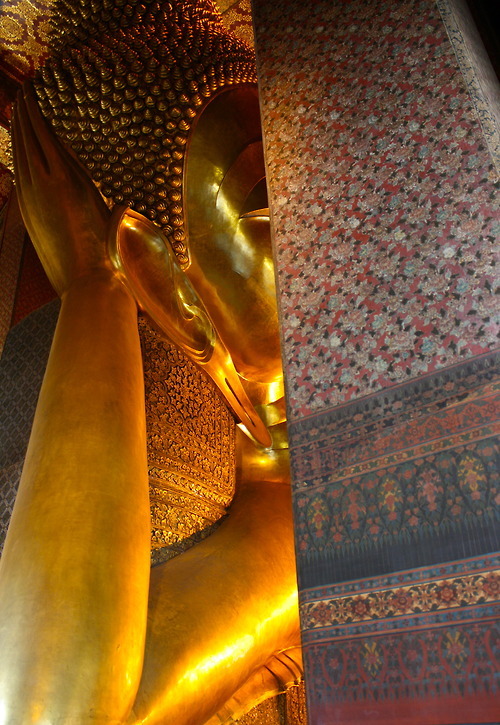 Golden Buddha, in Bangkok, Thailand. (January 2013) © A. Lindley. Image Source: Fides. Little Guests in the Moon Palace, 1972. 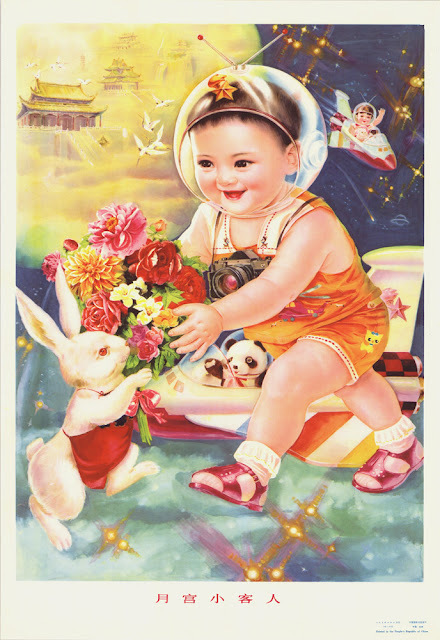 Image Source: Retronaut (1962-1985: Chinese Space Children Posters). Chris Quigley, The Opposite of Déjà Vu (11 May 2013) at Quigley's Cabinet: "Déjà vu, the strong sensation that a current occurrence has already been experienced, has a converse! Jamais vu is the eerie sense of undergoing something for the first time, despite knowing it has happened before. Both phenomena are recognized by the psychological and parapsychological communities, with explanations ranging from psychiatric disorder to reincarnation. But in 2006, cognitive neuropsychologist Chris Moulin of the University of Leeds put the phenomenon of jamais vu to the test. He induced it by means of "semantic satiation." In an experiment in which 92 subjects were asked to write common words including "door" 30 times in 60 seconds, 68% reported sensations of jamais vu. The words began to feel as if they were made up, misspelled, meaningless." 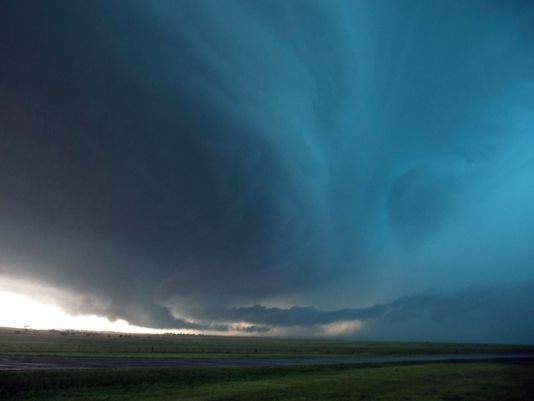 Oklahoma tornado developing, 31 May 2013. Image Source: Detroit Free Press. Jennifer James McCollum, Tornadoes and Destiny (28 May 2013) at Are You There God? It's Me, Generation X [JenX67]. On accident, destiny, and the apocalyptic tornadoes pounding her state of residence, Oklahoma, Jennifer James McCollum wrote of a trip to the store to buy supplies to prepare for future storms. She lost her receipt in the parking lot, meaning that she would be unable to return the items if they were not needed. This gave the fateful implication that the supplies would be needed. She mused on how we are subject to accident, much as we try to control our lives, but we still have a choice to shape our destinies: "A gust of wind took hold of it and blew it out of one of the bags. I chased it across the parking lot, but it climbed higher and higher. It twirled through the air just like that white feather in the movie Forrest Gump. And, then it jumped Northwest Expressway and landed in a tree. I thought of last week’s deadly tornadoes and all that was carried away and all that we will never hold again. I suddenly felt connected to the wind. Connected to all the things I can’t control. Things, people slip through our hands so easily. When we aren’t looking or even when we are. It’s so exhausting to be intentional about every moment of our lives. I wonder, is this how I have to live? ... The white feather that floats through the opening scene of the movie is symbolic of the events in our lives we can’t control. These circumstances make us who we are. and the lover who moved on. and the daughter who never calls home. and the wars into which we were born. The summer break that did not come soon enough. The feather can land anywhere. Our lives, our futures are unpredictable, but not our destiny. Mangled cars, collapsed walls and crushed neighborhoods cannot stifle it. Fields of debris cannot bury it. Death cannot abbreviate it. Our destiny is the effect we have on our world. It is in the simplest of terms how we choose to live our lives." Brett and Kate McKay, Latin Words and Phrases Every Man Should Know (25 July 2013) at The Art of Manliness. Maria Popova, Why Time Slows Down When We're Afraid, Speeds Up as We Age, and Gets Warped on Vacation (15 July 2013) at Brain Pickings. Popova notes recent work on how time is all in the mind, how and why memories are flexible, and how they shape our identities: "BBC broadcaster and psychology writer Claudia Hammond explores in Time Warped: Unlocking the Mysteries of Time Perception (public library) — ... the idea that our experience of time is actively created by our own minds and how these sensations of what neuroscientists and psychologists call 'mind time' are created. As disorienting as the concept might seem — after all, we’ve been nursed on the belief that time is one of those few utterly reliable and objective things in life — it is also strangely empowering to think that the very phenomenon depicted as the unforgiving dictator of life is something we might be able to shape and benefit from. Hammond writes: 'We construct the experience of time in our minds, so it follows that we are able to change the elements we find troubling — whether it’s trying to stop the years racing past, or speeding up time when we’re stuck in a queue, trying to live more in the present, or working out how long ago we last saw our old friends. Time can be a friend, but it can also be an enemy. The trick is to harness it, whether at home, at work, or even in social policy, and to work in line with our conception of time. Time perception matters because it is the experience of time that roots us in our mental reality. Time is not only at the heart of the way we organize life, but the way we experience it.' Among the most intriguing illustrations of 'mind time' is the incredible elasticity of how we experience time. ('Where is it, this present?,' William James famously wondered. 'It has melted in our grasp, fled ere we could touch it, gone in the instant of becoming.') For instance, Hammond points out, we slow time down when gripped by mortal fear — the cliche about the slow-motion car crash is, in fact, a cognitive reality. ... Inversely, time seems to speed up as we get older — a phenomenon of which competing theories have attempted to make light. One, known as the 'proportionality theory,' uses pure mathematics, holding that a year feels faster when you’re 40 than when you’re 8 because it only constitutes one fortieth of your life rather than a whole eighth. ... But one definite change does take place with age: As we grow older, we tend to feel like the previous decade elapsed more rapidly, while the earlier decades of our lives seem to have lasted longer. Similarly, we tend to think of events that took place in the past 10 years as having happened more recently than they actually did. (Quick: What year did the devastating Japanese tsunami hit? When did we love Maurice Sendak?) Conversely, we perceive events that took place more than a decade ago as having happened even longer ago. (When did Princess Diana die? What year was the Chernobyl disaster?) This, Hammond points out, is known as 'forward telescoping' ... And yet the brain does keep track of time, even if inaccurately. Hammond explains the factors that come into play with our inner chronometry: 'It is clear that however the brain counts time, it has a system that is very flexible. It takes account of [factors like] emotions, absorption, expectations, the demands of a task and even the temperature .The precise sense we are using also makes a difference; an auditory event appears longer than a visual one. Yet somehow the experience of time created by the mind feels very real, so real that we feel we know what to expect from it, and are perpetually surprised whenever it confuses us by warping.' ... But, curiously, we are most likely to vividly remember experiences we had between the ages of 15 and 25. What the social sciences might simply call 'nostalgia' psychologists have termed the 'reminiscence bump' and, Hammond argues, it could be the key to why we feel like time speeds up as we get older: 'The reminiscence bump involves not only the recall of incidents; we even remember more scenes from the films we saw and the books we read in our late teens and early twenties. … The bump can be broken down even further — the big news events that we remember best tend to have happened earlier in the bump, while our most memorable personal experiences are in the second half. ... The key to the reminiscence bump is novelty. The reason we remember our youth so well is that it is a period where we have more new experiences than in our thirties or forties. It’s a time for firsts — first sexual relationships, first jobs, first travel without parents, first experience of living away from home, the first time we get much real choice over the way we spend our days. Novelty has such a strong impact on memory that even within the bump we remember more from the start of each new experience.' Most fascinating of all, however, is the reason the 'reminiscence bump' happens in the first place: Hammond argues that because memory and identity are so closely intertwined, it is in those formative years, when we’re constructing our identity and finding our place in the world, that our memory latches onto particularly vivid details in order to use them later in reinforcing that identity. Interestingly, Hammond points out, people who undergo a major transformation of identity later in life — say, changing careers or coming out — tend to experience a second identity bump, which helps them reconcile and consolidate their new identity. ... Like the 'reminiscence bump,' the Holiday Paradox has to do with the quality and concentration of new experiences, especially in contrast to familiar daily routines. During ordinary life, time appears to pass at a normal pace, and we use markers like the start of the workday, weekends, and bedtime to assess the rhythm of things. But once we go on vacation, the stimulation of new sights, sounds, and experiences injects a disproportionate amount of novelty that causes these two types of time to misalign. The result is a warped perception of time.'" Click image to enlarge. Image Source: The Vault. Rebecca Onion, The Entire History of the World—Really, All of It—Distilled Into a Single Gorgeous Chart (12 August 2013) at The Vault (Slate's History Blog). Kate Sherrod, #DTTATDIWSF - aka the Definitive Top Ten All Time Desert Island Works of Speculative Fiction (16 August 2013) at Kate of Mind. Sherrod puts Harlan Ellison's Angry Candy on her list of desert island reads, with a passage from one story, "Eidolons," highlighted: "Did you have one of those days today, like a nail in the foot? Did the pterodactyl corpse dropped by the ghost of your mother from the spectral Hindenburg forever circling the Earth come smashing through the lid of your glass coffin? Did the New York strip steak you attacked at dinner suddenly show a mouth filled with needle-sharp teeth, and did it snap off the end of your fork, the last solid-gold fork from the set Anastasia pressed into your hands as they took her away to be shot? Is the slab under your apartment building moaning that it cannot stand the weight on its back a moment longer, and is the building stretching and creaking? Did a good friend betray you today, or did that good friend merely keep silent and fail to come to your aid? Are you holding the razor at your throat this very instant? Take heart, comfort is at hand. This is the hour that stretches. Djam karet. We are the cavalry. We're here. Put away the pills. We'll get you through this bloody night. Next time, it'll be your turn to help us." King Tutankhamun's mesmerizing brooch highlights a scarab gem created by a comet that hit the Sahara Desert. The origin of the gem raises questions about whether the Egyptians knew the gem's origin when they crafted the brooch's symbols. Image Source: Quigley's Cabinet. Chris Quigley, Space scarab (11 October 2013) at Quigley's Cabinet via Epoch Times. Quigley notes soon-to-be published research about this ancient Egyptian royal brooch; the scarab jewel at the centre is a bit of sand turned into glass by a comet hitting earth - the first evidence of such a violent space event: "I may have seen this amulet belonging to King Tutankhamun when I visited the traveling exhibition of his treasures in the 1970s. 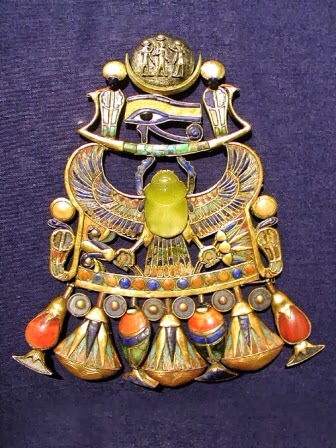 Little did I know that the yellow scarab at the center predates the ancient Egyptian king's 14th c. B.C. reign by 28 million years. That's when a comet hit the Sahara desert and heated the sand to such a degree that it formed silica glass and spread it over a wide area. The scarab, microscopic diamonds, and a mysterious black pebble dubbed 'Hypatia' have been found by an international collaboration of geoscientists, physicists, and astronomers to be the first physical evidence left on the planet by a comet strike." NASA and other space agencies have spent billions to secure comet matter. This is the first such material to be found intact on earth. For the published research at Earth and Planetary Science Letters (Volume 382, 15 November 2013, Pages 21–31), go here. Abandoned Monastery © urbex photographer Daniel Marbaix. Image Source: Facebook. Afternoon of a Newt (1998) by The Changelings; CD: Amphibian. 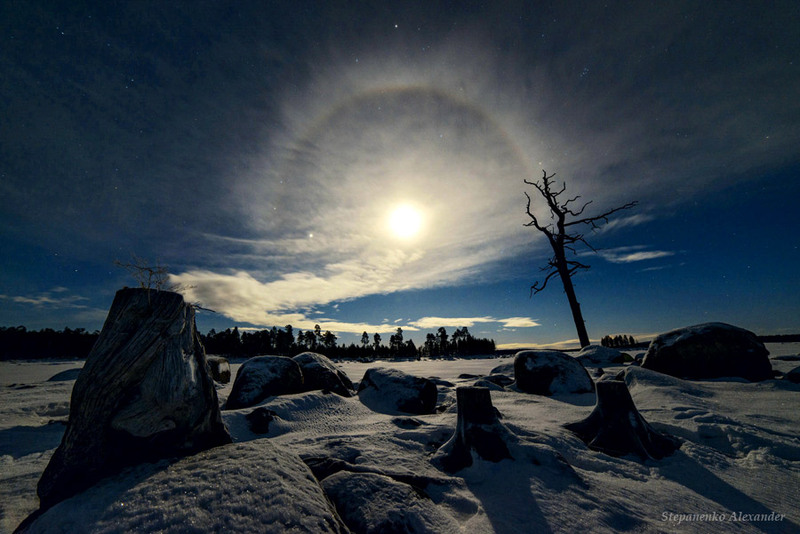 A Notable Photo of the 2014 International Earth & Sky Photo Contest. 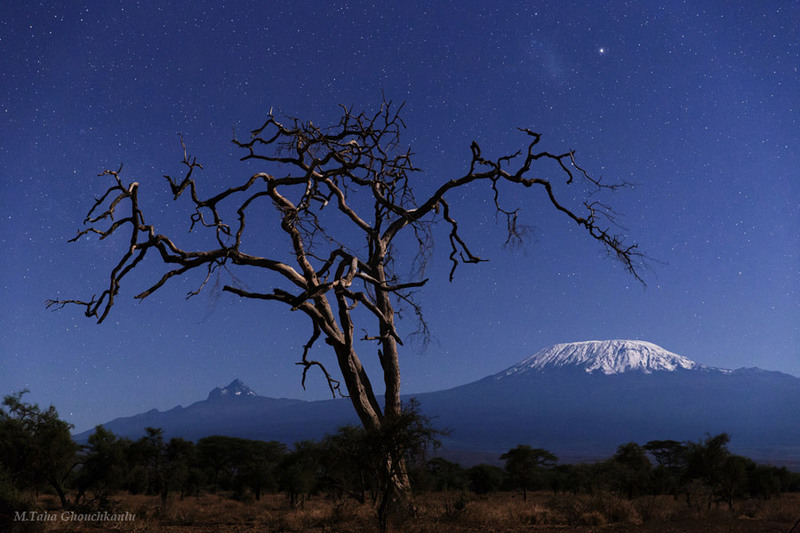 From the photographer: "A single tree under the night sky of Amboseli National Park, Kenya. The Kilimanjaro is standing tall in background." (2014) $copy; M.Taha Ghouchkanlu - tahapix.net. Image Source: TWAN. 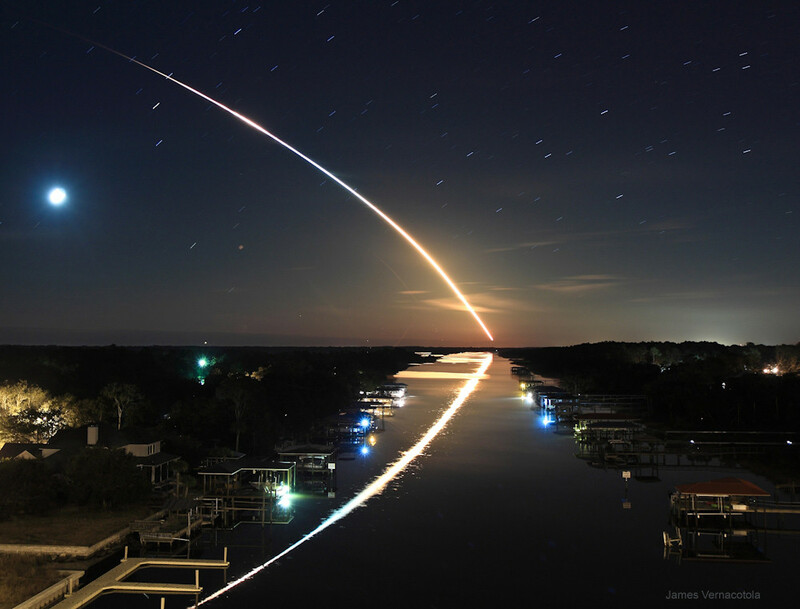 A Notable Photo of the 2014 TWAN International Earth & Sky Photo Contest. From the photographer: "The night sky in a panoramic view over a Buddhist shrine in Yunnan pronvince of China. Despite the light pollution of Fei lai temple, The zodiacal light and dazzling Venus appear over the Meili Snow Mountain on the left. The Milky Way from the Summer Triangle (left) to Orion (middle right) is arched over the sacred stupas and lights from nearby county Deqin. At this place, thirteen stupas line up to salute the Prince Thirteen Peaks of Meili Snow Mountain. The Kawagarbo peak, with an elevation of 6740 meters, is the highest in this range and regarded as one of the most sacred peaks in the Tibetan world." (2014) © Jeff Dai - flickr.com/photos/jeffdai. Image Source: TWAN. 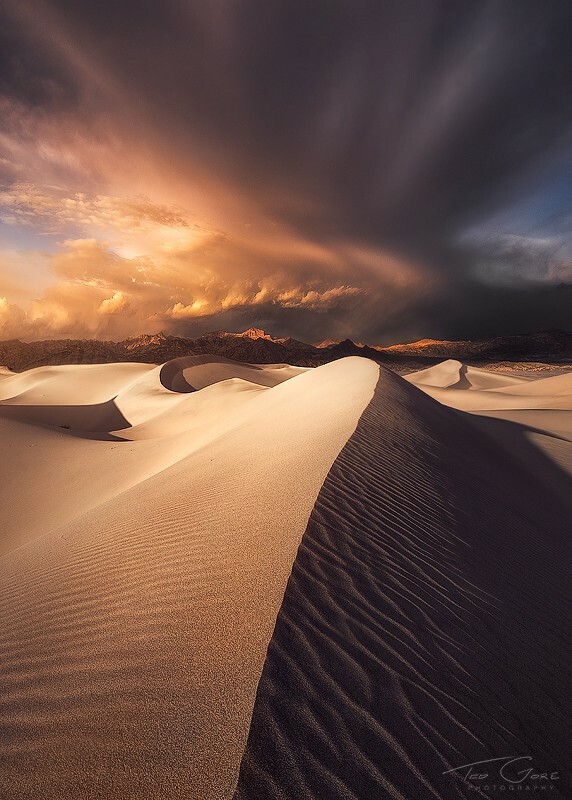 Hourglass: "An impressive cloud formation passes over the Mesquite sand dunes in Death Valley National Park. I've been lucky to get some pretty interesting conditions the few times I've been to this area. One of my favorite things I've done in the wilderness, is to be comfortably settled into the nice soft sand, watching weather move through the valley. Such a cool place." (8 February 2013) © Ted Gore. Image Source: Ted Gore. 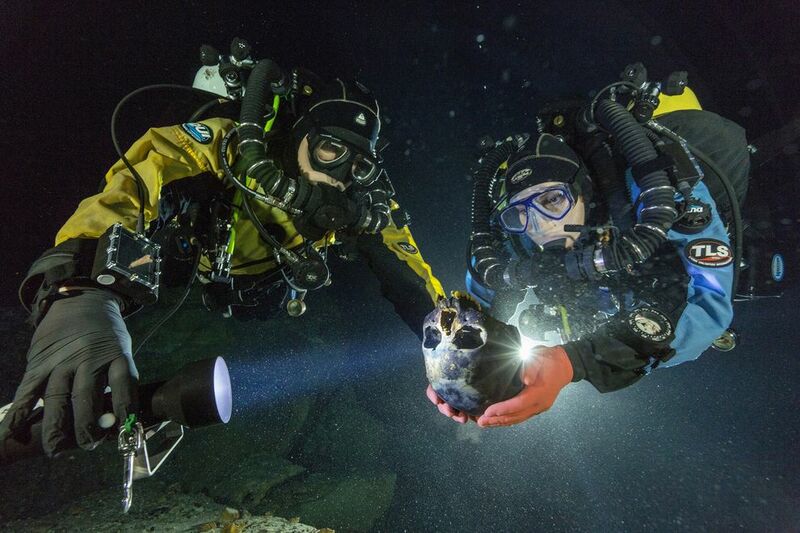 "In a flooded cave in Mexico, divers transport a skull for 3-D scanning. Between 12,000 and 13,000 years old, the skull is part of the most complete skeleton of such antiquity yet discovered in the Americas." Image Source: National Geographic. National Geographic, Most Complete Ice Age Skeleton Helps Solve Mystery of First Americans (14 May 2014). "The oldest complete skeleton of its kind ever found, dating to more than 12,000 years ago, is helping solve a mystery about the differences in body types between the first humans to arrive in the Americas and later Native Americans, scientists announced Thursday. Anthropologists have long puzzled over why Native Americans don't look more like their ancient ancestors, who migrated into the Americas during the Pleistocene, the epoch that encompassed the last ice age and that ended about 12,000 years ago." Malin Space Science Systems, Weekly Martian Weather Report / MRO MARCI (March 2015). Martian weather between 16 March 2015 and 22 March 2015: The MARCI acquires a global view of the red planet and its weather patterns every day. Please click and play the Quicktime movie (.mov file) to see how the weather on Mars changed during this time. Dust-lifting in the southern high latitudes of Cimmeria-Promethei developed into a large regional dust storm over the course of the week. The storm propagated eastward from Cimmeria into Sirenum obscuring the surface up to ~50°S latitude. By the end of the week, all southern longitudes from ~68°S latitude and southward were obscured by atmospheric dust to varying degrees. In the northern hemisphere, local storms were observed in Amazonis, northern Alba Patera, Chryse, Tempe, Deuteronilus, Acidalia, Utopia, and the Phlegra Montes. Water ice clouds persisted over Syria, Tyrrhena, and the Tharsis Montes each afternoon. Ground frost associated with the developing seasonal north polar cap edge was observed in areas not obscured by polar hood water ice clouds and dust storms. Despite all the storm activity in both hemispheres, skies over the two rover sites (Gale Crater and Meridiani) remained storm-free. @SciencePorn, Earth, Jupiter and Venus seen from Mars (30 March 2015) on Twitter. Debunked as fake: Phil Plait, An Unreal Mars Skyline (10 August 2012) at Discover Magazine: Bad Astronomy. subTV, OK Go have made an advert for a Chinese furniture company (24 March 2015). "This is a commercial we did for the Chinese furniture store Red Star Macalline. It's a visual reference to our video The Writing's on the Wall but set to a remix of I Won't Let You Down by our very own Dan Konopka. Because sometimes you just make what you want." Video Source: OK Go via Youtube. The statue of the South China Sea Kwan-yin Bodhisattva at Hainan Sanya Nanshan Temple. Image © (2013) jumbogrand/deviantART. 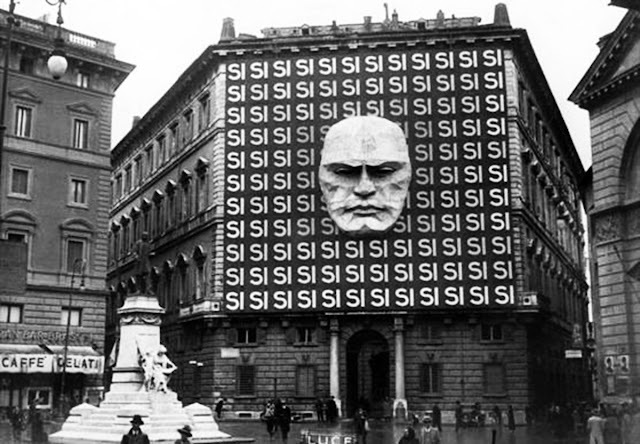 The headquarters of Mussolini's Italian Fascist Party, 1934: "The building in the picture is Palazzo Braschi in Rome, the headquarters of the Fascist Party Federation (the local one, not the national Party headquarters). It was not always covered up like that; this set-up was displayed for the 1934 elections, in which Italians were called to vote either for or against the Fascist representatives list. The 'SI SI…' lettering (meaning 'Yes Yes…') was propaganda for one of the two plebiscite elections held during the Fascist Regime, where electors didn’t vote for individual parties (there wasn’t any but the Fascist one), neither for single candidates, but just voted 'Yes' or 'No' to a single list of candidates presented by the Duce himself." Image Source: Rare Historical Photos. to write from the position of a cell in an organism, in the span of time after its heart has stopped beating. Together With You - JR Tundra. Video Source: Youtube. Temple of Love ⚜ Petit Trianon Activation (16 July 2017). Video Source: Youtube. - Listed in order as found online. This page will be updated occasionally.